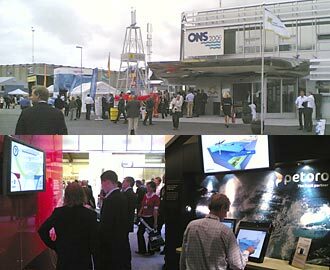 ONS 2006 Offshore Northern Seas in Stavanger was a great success again in 2006. Held from Tuesday 22nd to Friday 25th August - this trade show / conference / exhibition took every hotel room and restaurant table in the area. This is a huge event to manage, so congratulations to the management team of Offshore Northern Seas. ONS has now been going for 32 years, and it has firmly established itself as the largest oil industry show in Europe, in what is becoming the Oil capital of Europe. The theme for this year was "Bridging the Energy Gap" and well done to ExxonMobil for an exhibition stand that was informative and very thought-provoking - more about them in our highlights review of some of the best stands tomorrow, including Petoro - for a 3 minute interactive game that explained and demonstrated the main design choices in oilfield development, as well as the financial consequences; Welltec for their stand describing the challenges and solutions to working in horizontal wells; Statkraft for their views on hydrogen power and osmotic power, and Allseas/Excalibur, for great models and knowledgable people explaining their solutions to pipeline laying and trenching, as well as production platform abandonment. There were hydrogen cars here this year - from Mazda and Statoil - and we thought they deserved some attention in their own page. Rather less impressive were some of the oil company stands - BP seemed to have little to say and apparently few people to discuss business with; Shell showed a car from a fuel-efficiency competition but not much else; Statoil had a huge screen showing very little; Total had white books on white walls and the air of a parallel universe. We heard that Hydro had some good presentations, but unfortunately we missed it. Everyone seems to accept that the show costs a lot to put on, and that being there is not cheap, but the complaint heard a lot was about 625 kroner per day to park a car in the nearest car park (and too few shuttle buses to and from the main car parking). A successful show, and thousands of exhibitors able to do their business - complete with the Spanish Harlem Orchestra at the main harbour, and fireworks to follow, on Thursday evening.